We’ve mentioned the incidence question several times before, but TJN’s Director John Christensen was at a debate in London last night on the future of the corporate income tax, alongside Mike Devereux of the Oxford Centre for Business Taxation; Helen Miller of the Institute for Fiscal Studies; Simon Walker of the Institute of Directors, and Margaret Hodge, chair of the UK All Party Parliamentary Group on Tax. It is this claim that is the great incidence hoax. There is no such consensus: and we argue that the opposite is true. Some politicians and pundits like to claim that the burden (or “incidence”) of corporate taxes falls mainly on workers – implying that the corporate tax is a bad, regressive tax that strikes the poor hardest. This is quite untrue – as one leading US economist puts it, ‘there is simply no persuasive evidence of a link between corporate taxation and wages’. But the argument is commonly made so it is worth addressing here, in theory and in practice. First, the theory. Those who claim that the burden falls not on owners/shareholders but on ‘workers’ need to answer the questions below. Do they seriously believe that corporate bosses, in this era of weak collective bargaining, would voluntarily pass the benefits of a tax cut onto their workers, instead of feeding the share price and their own stock options? All the evidence points the other way. Corporate bosses always behave as if tax burdens fall on shareholders. Would they spend so much time and energy finding clever ways to dodge tax if they believed that taxes didn’t fall ultimately on their shareholders, to whom they are accountable? If corporate taxes don’t fall on shareholders, then why do shareholders and investment intermediaries behave as if they do? It is easy to demonstrate that share prices respond strongly to sudden unexpected changes in expected corporate tax bills. Corporations are sitting on oceans of idle cash, as Section explains. Wages are stagnant in many countries: when, exactly, are corporate bosses planning to pass these idle cash hoards on to “workers?” And how would tax cuts change their behaviour? If wage rates are set in labour markets, as classical theories suggest, then why would companies change their pay policies by ignoring labour markets and instead responding directly to corporate tax changes? Why haven’t they paid them more already? Why do the proponents of tax cuts focus only on the narrow issue of labour anyway? The fact that corporation taxes fall (as they do) on different groups in different ways is only a first step in exploring the distributional implications of these taxes. This should instead be viewed in the context of broader society: do or can corporation taxes make the whole tax system more progressive? Who are the “workers” on whom these corporate taxes fall, anyway? If it’s a profitable capital-intensive firm with a small wage bill and high returns to capital, it will be mathematically impossible for anything more than a small slice of the tax burden to fall on ‘workers.’ If it’s a hedge fund, or a single-person shell company set up as a vehicle to help its owner avoid tax, then if there is a portion of the corporate tax charge that falls on ‘workers,’ then it would make the system more progressive overall anyway. If it is highly paid bankers, then corporate taxes will curb the wealth-extracting bonus culture that has fostered widespread risk-taking at taxpayers’ expense. Many of the ‘incidence’ arguments rest on the idea that corporate taxes scare away ‘investment.’ But as Section 3.3 explains, tax-sensitive investment is by definition the least useful stuff: accounting nonsense and papershuffling that does not involve very much employment creation at all. If corporate taxes force wages down, doesn’t this sit uncomfortably with the fact that effective corporate tax rates have fallen steadily in most countries of the world since the 1980s (see the Introduction), but wages have fallen too, while corporate profits have soared? Tax cuts increase the economic resources of corporations. Corporate bosses manage those resources, so tax cuts increase the powers of corporate bosses. Leaving aside the economic arguments, how could corporate tax cuts not boost political inequalities? Now consider how all this plays out internationally. Will tax rises choke off foreign investment, hurting workers? Consider an African oilfield or a gasfield in Australia. A corporate tax won’t scare away the oil company: they will go where the oil is, not where the tax breaks are. This is true of many profitable investment opportunities: an Indian telecommunications licence, say, or a supermarket franchise in Turkey. These are all largely immobile, rooted in the local economy, and won’t flee if taxed. And those relatively few that do, in a world awash with idle corporate capital looking for investment returns (Section 7), will generally be replaced soon enough. On the evidence side, all the lobbying and corporate opinion wielded in support of the proposition that the corporate tax burden largely falls on workers has muddied the debate. Yet as the footnote here shows, numerous independent bodies have concluded after exhaustive studies that the burden largely falls on the owners of capital — that is, predominantly wealthy people. 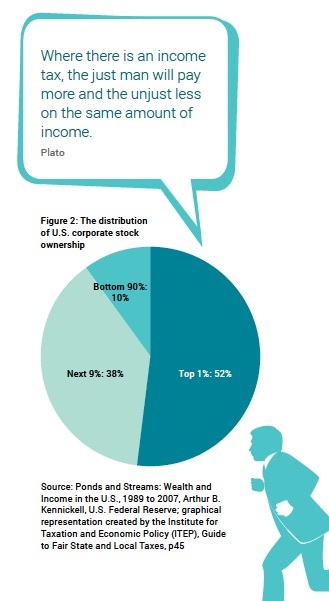 In short, the corporate tax falls largely on wealthy capital owners. It is a powerful and precious vehicle for reducing inequality, within and between countries. Given the role that corporate taxes play in curbing economic inequalities, and the growing literature highlighting the fact that higher inequality tends to cause lower economic growth, there is a plausible case for suggesting that corporate tax cuts may hurt economic growth. Distribution of Household Income and Federal Taxes, U.S. Congressional Budget Office, 2012, p16, which works on the basis that 75 percent of the burden of the corporate tax falls on capital. Gravelle, Jane G. and Kent A. Smetters. 2006. “Does the Open Economy Assumption Really Mean That Labor Bears the Burden of a Capital Income Tax.” Advances in Economic Analysis & Policy vol. 6:1. See also How the TPC distributes the corporate income tax, Urban Institute and Urban-Brookings Tax Policy Center, Sept 13, 2012, which finds that 80 percent of the burden falls on capital. The U.S. Treasury uses a rate of 82 percent: see Distributing the Corporate Income Tax: Revised U.S. Treasury Methodology, May 17, 2012. Higher corporate cash piles in recent years presumably will shift the burder still further away from workers. See also Sharing the Burden: Empirical Evidence on Corporate Tax Incidence, Nadja Dwenger, Pia Rattenhuber, Viktor Steiner, Max Planck Institute for Tax Law and Public Finance, Working Paper 2011 – 14 October 2011, which finds empirically that labour bears 19-29 percent of the burden of the corporate income tax. In small countries and tax havens, tax rates will have more impact on wages, but even then — and this applies to large as well as small countries — these effects, such as they are, will disproportionately impact the skilled, highly remunerated professions such as accountancy and law firms, meaning that tax cuts will tend to increase inequality. I’m not an economist and I haven’t read more than a small fraction of the voluminous literature on tax incidence. But the common use of this word “incidence” does seem misleading, insofar as it’s used to imply an automatic, almost natural process that can be measured by equations and determined by economists. TJN doesn’t do this but plenty of others do. It seems obvious to me that the “incidence” of corporate income tax will be determined by decisions taken by a company’s directors: how big a dividend to pay, what wages to offer, what prices to charge customers, etc. Directors will make these decisions based on various external and internal factors. External factors would include the desires of shareholders and the degree of their influence over management, the legal framework and the influence of trade unions, supply and demand for particular types of labour that the company uses, or goods and services that it produces, etc. Internal factors would include the directors’ own interests and beliefs and the culture and internal politics of the company. Now, presumably the interplay of these factors will change over time and won’t necessarily produce the same result in every situation. A lof of them may not be easily discernible by an outsider or show up clearly in the kinds of data that a company publishes, which is why I’m wary of the idea that economists will always have a better grasp on this problem than, say, anthropologists. But it seems reasonable that when certain factors carry more weight than others, then directors will make decisions which favour them. For example, when directors are personally rewarded by a high share price in the short term, then it seems logical that if the company’s tax bill is lower in a given year, then directors will be inclined to pay out more of the “savings” in dividends than, say, in paying higher wages to employees. So although I can’t claim to be a specialist, I struggle with these confident assertions that “x per cent of the incidence of corporate income tax falls on workers.” What that seems to mean in reality is: “The set of human beings who are the directors of a company , given all the factors that influence them at the point of decision, to respond to a higher tax bill by paying their workers less than they otherwise would have done.” Which is not the same thing at all. Change some of the factors – for example, by introducing stronger labour laws or more patient shareholders – and the outcome might be quite different. Tax increases are pushed onto customers whenever possible. Only if competition/external factors prevent a company from raising prices will they look to reduce employment or pay less to suppliers to make up for tax hike. As last resort, the shareholders will bear the burden of the tax increase. Tax decreases are pocketed by shareholders and business executives. Only if competition/external factors require the company to lower prices will the company’s customers get the benefit of any business tax decreases. Let’s also remember that “Only humans pay tax.” Artificial entities like businesses may be efficient tax “collectors,” but artificially created entities like corporations never “pay” any tax. Only their customers, employees, executives and/or shareholders pay any tax imposed on a business. So you’re saying it’s an asymmetrical response: when taxes go down, it’s shareholders who pocket the difference, but when they go up it’s generally customers who pay? It’s an interesting analysis: do you have any evidence for this. Bearing in mind that the ‘evidence’ on this general question is so clouded by claims and counter claims that it’s impossible to be clear, and it’ll vary by sector, country, time period and so on. Also, on the ‘only humans pay tax’ question, take a look at this, just in. http://dqtax.tumblr.com/post/140018728836/the-other-four-fifths-of-the-corporate-tax We’ll blog it soon. Oh dear: that working paper listed at the end, the one from 2011 by Nadja Dwenger, Pia Rattenhuber etc actually says in the abstract that a 1 euro decrease in CIT increases wage costs by 0.47 euro. They do provide a different number for this effect two years later. The contention that CIT is incident on a combination of owners ( who are often workers anyway ), workers and customers holds up even on the lowest empirical number. Anyone trying to exclude one of those groups from the incidence of CIT, and Alex really really does attempt to do this in the initial part of the tv debate, is delusional. Forgive the length of this comment, which is prompted by the length and complexity of Ten Reasons. Last April Martin Hearson commented “TJN’s paper, written by Nick Shaxson, is typically polemical, smartly designed and peppered with quotes from authoritative sources in support of its case, which is of course that corporation tax is good, and under threat”. I thought it might be worth looking for any alternative views. As a general point, I doubt if complex arguments on how the economy operates are ever capable of being judged entirely right or entirely wrong. Wheeling in more and more sources to act as cheerleaders for a point of view isn’t necessarily going to persuade people and settle the argument. From what I can see the discussion is more about the impact of changes to tax systems, not the steady state. It must be the case that if there is a tax rise then somebody has to pay for it. Logically, there are only a few ways this can happen (apart from evasion or avoidance, in which case the State pays for it). The main groups are shareholders (reduced dividends); labour (lower wages); customers (higher prices); suppliers (lower purchasing prices). So the argument seems to have settled on the impact on capital/labour, ignoring customers or suppliers. As the blog says, the evidence is in endnote 24. One source is Jennifer Gravelle, in Reports in 2006 and 2012. This reviewed the data, and earlier studies, concluding that capital bears the majority or possibly even virtually all the burden. “At the end of the searching, I find some evidence that suggests that corporate taxation may lower wages, but the preponderance of evidence does not suggest any wage effects from corporate taxation. Despite the findings of other studies, perhaps this is not a surprising result. Corporate tax incidence is difficult to model, and many models leave out important considerations. Economies are very complex, and myriad economic forces determine labor market outcomes. Perhaps we should be more surprised if the data do give a clear answer to this complex question. Still, despite limitations, other studies have frequently found that corporate taxes lower wages. What can account for these results? It is possible that data and methodological issues are at work, but it may also reflect other factors. For example, it may be that corporate taxation does depress wages, but the complexity of real world economies makes it difficult to observe these relationships with such a comprehensive approach. So I think there is no consensus. Maybe the answer is we don’t really know if CIT is hitting those wealthy capital owners as hard as some might want. The jury is still out and they may be away for a long time. Thanks for the reply. Is it possible to link or merge the comments here with the other concurrent item on tax incidence? I think readers would find that helpful. It seems potentially feasible that there is a “hoax”, namely that the incidence falls predominantly on workers. As you say, there is no consensus. But there seem enough academic disagreements to make it hard to support reversing the line to say “the burden largely falls on the owners of capital”. um, not sure about merging the comments, but we can link up all the posts to each other, which provides a bit of continuity. Robert Frances says:	February 26, 2016 at 1:53 pm is almost right. Consumers pays all taxes imposed on companies, that includes IT and NI. IT and NI are deducted and not paid. Companies pay no taxes, only collect the taxes from the consumers and transfer the taxes to the incompetent government. The burden therefore falls onto the consumers. The burden is therefore a ’cause’ under the law of cause and effect and any actions to circumvent changes in taxes are ‘effect’. The effects are numerous depending on the company’s goods and services and their market. it’s just not true. Corporate taxes impact consumers, shareholders and workers. The share of what hits who, where, is different in different situations, but the evidence suggest that most and even the large majority tends to fall on capital, that is shareholders. In competitive global markets companies can’t just raise prices to consumers in response to a tax charge. A) The consumer will pay £5.50 tax and the my profit will drop to £0.50. Assuming that i can not increase the good to £10.50 and that the i had no time to make adjustment because the tax increase was sudden. B) If the tax were to take effect in 6 months time and i can not increase the good to £10.50, i may allow my profit to drop to £0.50 or reduce the operating cost from £4 to £3.50. Reduction in operating costs may be done by increasing productivity or paying workers less or workers doing less hours or a worker gonna get ‘fired’. Any combinations. The difference between A and B is time. C) If the demand for my good is inelastic or lack of competition, i can get away with charging £10.50. The effect will be on other companies via reduced disposable income. Whatever happens the consumers will still pay £5.50 in tax. That’s where the tax burden/incidence IS. Saying that the seller and buyer share the tax burden is plain wrong. The rules of accountancy can disprove this. Whatever happens after the tax increase are ‘effect’. One other thing. “in a world awash with idle corporate capital” – no money is idle. Corporation put the money in banks, not under the mattress, and the banks lend the money out. Nothing is idle unless it is taken out of the system. The trillions of cash the corporation holds does not belong to them. It belongs to the shareholders and pension companies, for example, are not shareholders, the pensioners are. The money belong to the pensioners, among other groups, and this hiding money in offshore account is one of the main reasons why annuities are falling. The distributional, political and economic aspects of this are huge. Shares and pensions are owned, controlled and enjoyed overwhelmingly by the richest sections of society. Banks are lending out to create daisy chains of securitisation, among many other things: a huge amount of this is unproductive capital. Why should the distributional, political and economic aspects of this be huge? Have you ever watch Dragon Den? That’s all society need to know in order to understand that the money offshore belongs to the investors and those investing in pensions are investors. (Dragons). Profits must be distributed yearly as dividends. All it requires is the change of crony laws. That won’t happen unless someone explain to society why they are being swindled and that there is no such a thing as ‘tax avoidance’. Then the masses can start protesting properly instead of protesting about stupid things that they don’t understand. Yes there is so much more going on but all is irrelevant. All that matters is that the cash held back by companies should be distributed as dividend to investors, including pensioners.